The dominant figure in Sri Lankan Maoism was Nagalingan Sanmugathasan, a founder and one-time leader of the Ceylon Communist Party (CCP) . A Tamil born in Manipay, Jaffna District, Sanmugathasan had been a student leader at University College Colombo. He later headed the Ceylon Trade Union Federation (CTUF), playing an important role in several strikes, including the general strike of 1947, the Hartal (general strike) of 1953, and a transport strike in 1955. A Politburo member identified with pro-Chinese positions he was expelled from the Ceylon Communist Party in 1963, after having gone to Peking for talks that May and returned to organize anti-revisionist rallies, publish pamphlets and distribute Chinese polemics. However, political disagreements within the Ceylon Communist Party pre-dated the Sino-Soviet dispute. The tensions within the party were primarily concerned with the line in domestic politics that saw a dedication to the “parliamentary way” and the creation of an alliance with the LSSP [Lanka Sama Samaja Party] and work in the United Left Front. The inner-party opposition coalesced around Sanmugathasan. A leading opponent of the revisionist programme, he argued, “The tactic of building a parliamentary united front is an illusion and a dangerous distraction; only unrelenting militancy against the neo-colonial structures of our country can bring results.” The anti-revisionist forces vigorously opposed the emergence of the LSSP alliance; it collapsed within 18 months when the LSSP, abandoned the CCP and entered into coalition with Mrs Bandaranaike’s self-proclaimed social democratic party, the Sri Lanka Freedom party [SLFP] operating a policy of Sinhala-Buddhist populism. 1) Translate into Sinhalese and publish immediately as many [Marxist] classics as possible; 2) Bring out Kamkaruwa and Tholilali (the Sinhalese and Tamil versions of the CTUF organ, The Worker) as good working-class weeklies, with the prospect of turning them into the first working-class dailies within a year; 3) Start a Marxist theoretical journal in Sinhalese and Tamil; 4) Build the unity of the trade union movement and achieve a united trade union centre as soon as possible; 5) Organize the peasantry and build up a worker-peasant alliance. The split was completed at a three-day congress which ended on January 21, 1964. The pro-Chinese forces led by Nagalingan Sanmugathasan and Premalal Kumarasiri, editor of the CCP Sinhalese weekly, repudiated the revisionist and pro-Soviet policies of the official Ceylon Communist Party and elected a Central Committee to reject the leadership of President Wichremasinghe and Secretary-General Keuneman. The new party, which was thus born became popularly known as the Ceylon Communist Party (Peking) to distinguish it from the pro-Moscow CCP. It was noted for its militancy and mass protests. It maintained a support basis in the trade union movement and specifically in the Ceylon Plantation Workers’ Union and in the leadership of the Ceylon Trade Union Federation. It also won a majority of members of the old party’s youth league. Although its rhetorical advocacy of armed struggle was never put into practice, it influenced other militants in the Tamil struggle. 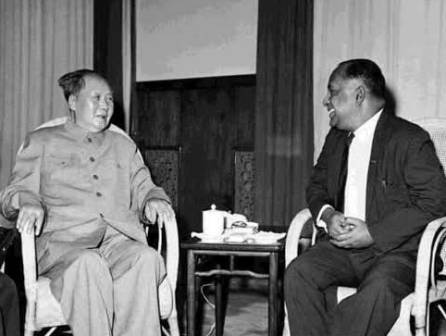 The CCP (Peking) whilst active in the defence of Tamil rights, by the late 1960s began to be politically outflanked by younger and more militant elements in Tamil society that took to armed struggle for resolution of the national question in the island state. These groups included the secessionist Tamil United Liberation Front and the Liberation Tigers of Tamil Eelam. Shanmugathasan visited China during the Cultural Revolution and addressed thousands of Red Guards. 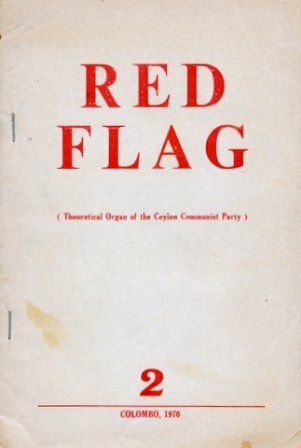 In the publication “The Bright Red Banner of Mao Tse-tung Thought” he wrote a polemical promotion of Marxism-Leninism-Mao Tse-tung Thought that had an international audience. On the international scene Shanmugathasan played a liaison role between China and other parties, such as the CPI (ML), travelling to Party Congress in Albania, China and remaining in contact with the Indian Maoist scene. In 1971 Sanmugathasan was imprisoned for one year during a crackdown on revolutionaries following the Janatha Vimukthi Peramuna (People’s Liberation Front) rebellion. The JVP was widely believed to have its origins as a secret faction inside the CPP in spite of the criticism expressed by the Party of the JVP’s actions. Sanmugathasan was targeted by the government for his espousal of armed revolution and for being one of the political mentors of Rohana Wijeweera, the founding leader of the JVP. While detained in prison Sanmugathasan authored a book, A Marxist Looks at the History of Ceylon. 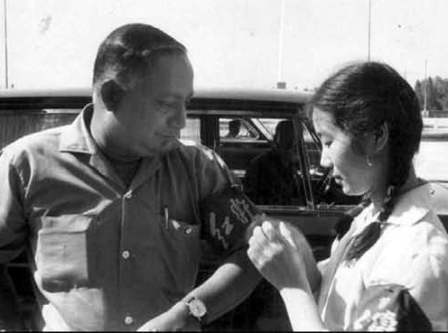 In the aftermath of the failure of the 1971 insurrection, the CCP politically suffered from the Chinese government’s support given to Mrs Bandaranaike’s government. There was an attempt to seize the leadership of the CPP by Watson Fernando, secretary general of the Ceylon Trade Union Federation when Sanmugathasan was out of the country. The attempt was defeated upon Sanmugathasan’s return in September 1972. The expelled Fernando group reformed as the Communist Party of Sri Lanka (Marxist-Leninist). The CPSL (ML) was more inclined to support “progressive” actions of the Bandaranaike-led United Front government, while the Ceylon Communist Party continued its policy of militant opposition. In 1976, after the death of Mao Zedong and the fall of the “Gang of Four,” the CPSL (ML) continued to support China’s domestic and foreign policies. The CCP and Sanmugathasan, on the other hand, defended the legacy of the Mao and the Cultural Revolution. Sanmugathasan was active in the foundation of the Revolutionary Internationalist Movement, authoring another polemical defense of Mao in the article entitled “Enver Hoxha Refuted”. In 1991 a CCP conference was held at which it reconstructed itself as the ’Ceylon Communist Party (Maoist)’. Shanmugathasan led the party until his death in 1993. His last public appearance was at the first press conference of the International Emergency Committee to Defend the Life of the Peruvian revolutionary, Chairman Gonzalo aka, Dr Abimael Guzmán in London. He died in England in February 1993 where he had gone for medical treatment. Unite All the Revolutionary Forces to Overthrow the UNP! Statement of the Ceylon Communist Party: Reject The Path Of Peaceful Transition To Socialism Through Parliament! Unite For The Revolutionary Overthrow of Imperialism, Feudalism And The UNP! The Communist Party of Sri Lanka (Left) was founded on July 3, 1978 from a split in the Communist Party of Sri Lanka. That split arose over differences concerning the stand of the party on the ’Three Worlds Theory’; the national question; united front activities; and building the Party as a revolutionary organization based on democratic centralism. The new Party was Maoist in character. The new party initially endorse the ’Three Worlds Theory’ but later acknowledged that this decision had been wrong.